Tag: authorities, beach, chadwick, crime, federal, fugitive, marshals, most wanted, murder, newport, Newport Beach, Peter Chadwick, Peter Gregory Chadwick, podcast, police, Q.C., QC, search, true, U.S.
Newport Beach Police Department Chief Jon Lewis speaks at a press conference Wednesday about the search for a murder suspect, Peter Gregory Chadwick. The hunt for a fugitive and murder suspect from Newport Beach intensified this week, as he was placed on a federal most wanted list and the reward for his capture was set at $100,000. 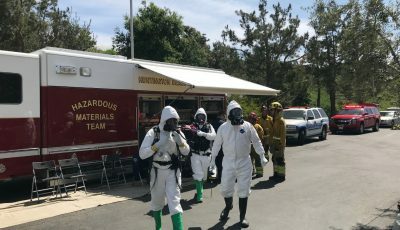 Newport Beach Police Department held a joint-agency press conference Wednesday, announcing that Peter Gregory Chadwick, 54, has been placed on the U.S. Marshals Service 15 most wanted list and that the reward is now higher than ever. 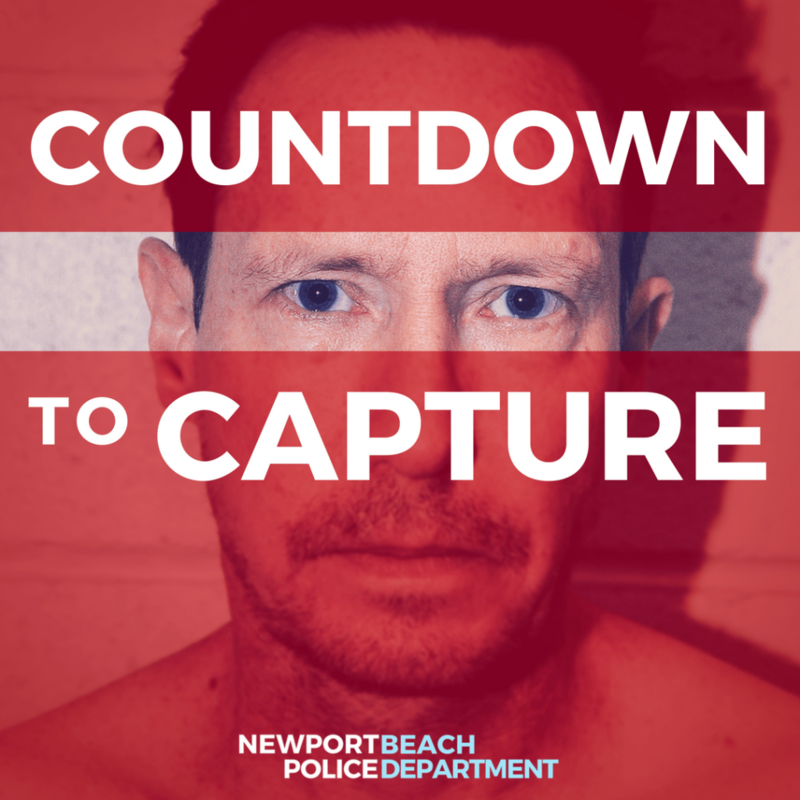 Police also announced their new “Countdown to Capture” true crime podcast on the case, written and produced by the NBPD. They plan to release six episodes, each about 15 minutes long, on Tuesdays, Thursdays, and Saturdays. An introduction and the first two episodes are already published. 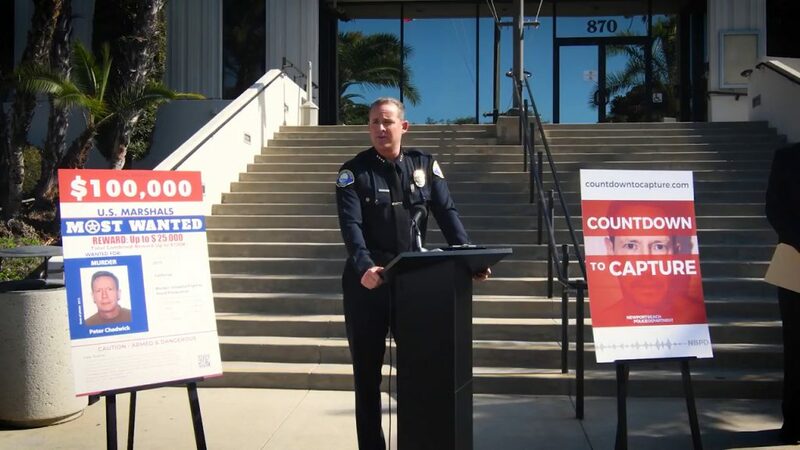 At the press conference on Wednesday, Orange County District Attorney Tony Rackauckas spoke directly to Chadwick. “Mr. Chadwick, you’re in a very bad situation here,” Rackauckas said. He’s a fugitive from justice with a $100,000 reward on his head, the word will spread to every corner of the world, the OCDA noted. Peter Gregory Chadwick at the time of his arrest. He is now a fugitive wanted on suspicion of murder. Chadwick “could be anywhere in the world,” Lewis said. He has the financial means to avoid the restrictions placed on his travel. Chadwick has a “great deal” of money at his disposal, explained NBPD Spokesperson Jennifer Manzella. Before he disappeared, Chadwick emptied out bank accounts and took out cash advances on credit cards, resulting in millions of dollars, she said. “At this point, it really seems to be a mystery where Peter Chadwick could be,” Manzella said. Because of Chadwick’s access to monetary resources and his extensive international ties, authorities believe he may have fled the country. Due to the nature of his crime, he should be considered armed and dangerous. Authorities are following every lead, but don’t have information to narrow the search down to one particular country, Manzella said. On Oct. 10, 2012, neither Chadwick nor his wife, Quee Choo “Q.C.,” arrived to pick up their three children from school. Another parent spotted the kids, who had been waiting for more than an hour at the pick-up location, and drove them home. After failing to get ahold of either Chadwick parent, the neighbor then requested a welfare check from the Newport Beach Police Department. A subsequent search of the home by NBPD revealed blood and signs of a struggle inside the home. 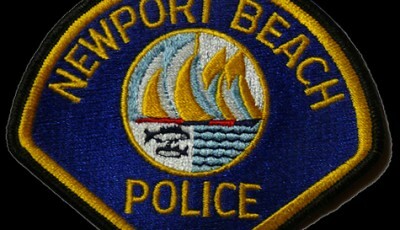 NBPD began investigating the whereabouts of the couple. The following day, Peter Chadwick called 911 from a San Diego gas station. He told local authorities that his wife had been killed by a handyman, who had subsequently kidnapped him, and then taken her body. Chadwick, however, quickly became the primary suspect in his wife’s death. Detectives who interviewed him doubted his story, especially when they noticed scratches on his neck and dried blood on his hands. He was arrested for the crime later that day, police reported. One week later, Q.C. 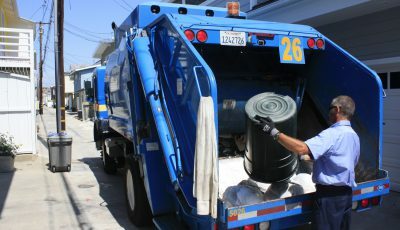 Chadwick’s body was discovered in a dumpster in the 12000 block of Wildcat Canyon Road in Lakeside in San Diego County. Peter Chadwick allegedly strangled his wife to death at their Newport Beach home over a dispute regarding a possible divorce and related financial issues, according to authorities. Chadwick was out of police custody after posting $1 million bail on Dec. 21, 2012. A person has the right to bail, Rackauckas noted on Wednesday. “The judge set the bail at that, and that’s what we had to live with,” Rackauckas said. Chadwick, a British native, was ordered to surrender his passports and stay with his father in Santa Barbara to await his trial. The defendant had made 13 court appearances before disappearing, Rackauckas explained. But when Chadwick failed to appear for a scheduled pre-trial hearing in January 2015, he became a fugitive from justice. Authorities contacted the U.S. 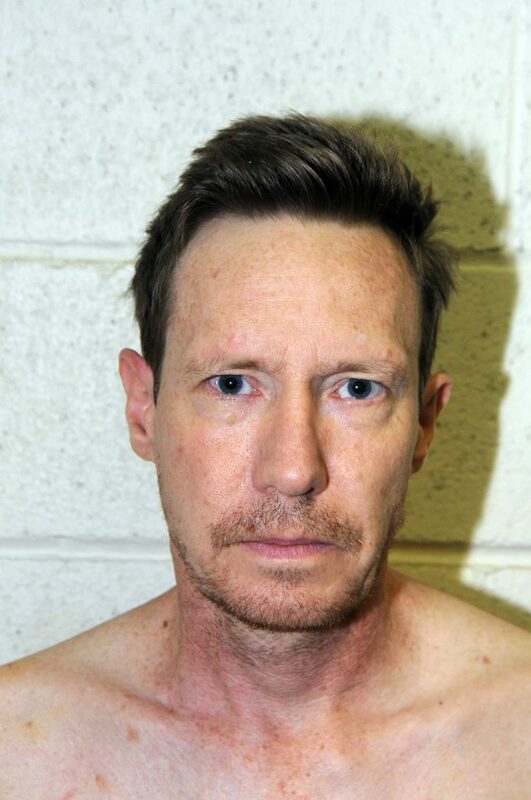 Marshals Service Pacific Southwest Regional Fugitive Task Force, who discovered books Chadwick allegedly read about how to change one’s identity and live off the grid. 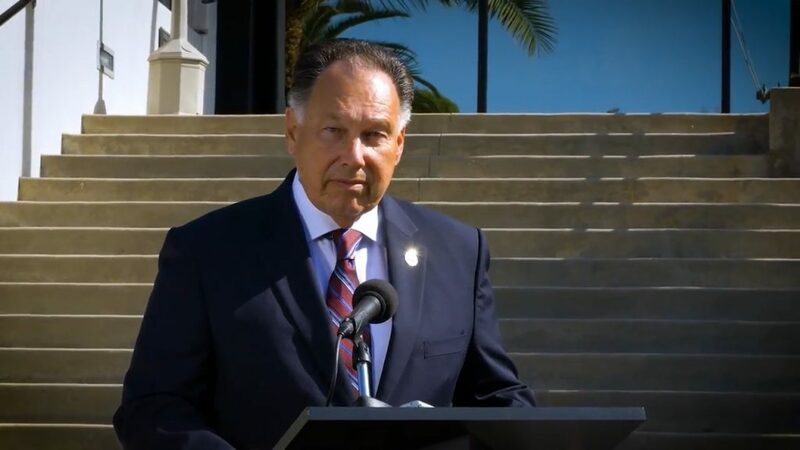 Orange County District Attorney Tony Rackauckas speaks at a press conference Wednesday about the search for a murder suspect, Peter Gregory Chadwick. Placement in the U.S. Marshal’s top 15 most wanted list is reserved for those suspected of the “most heinous” crimes, like what Chadwick is accused of, explained U.S. Marshal for the Central District of California David Singer. “Our track record stands behind that statement,” Singer added. Since the program’s inception in 1983, they have arrested 243 fugitives on the 15 most wanted list. “We look forward to adding Chadwick to that arrest count,” Singer said. 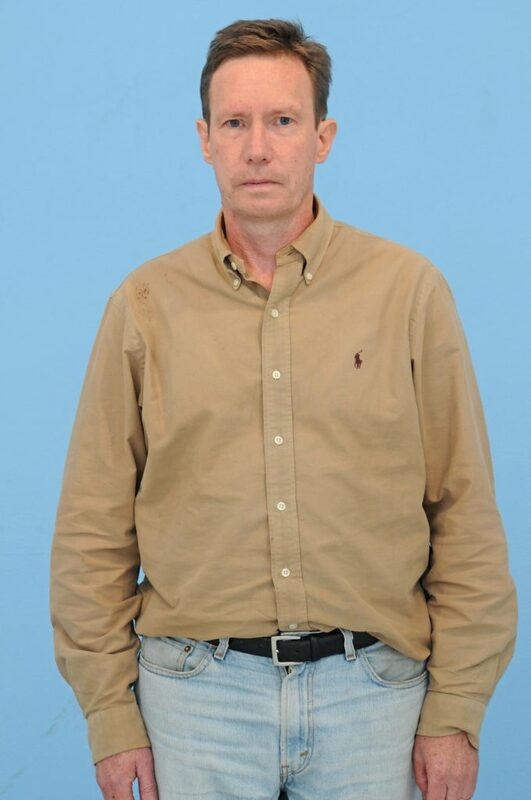 Law enforcement describes Chadwick as a 5-foot-7, white male weighing 160 pounds with brown hair and blue eyes. He may be using aliases Gregory or Pete in an attempt to hide his true identity. A reward of up to $25,000 is being offered by the U.S. 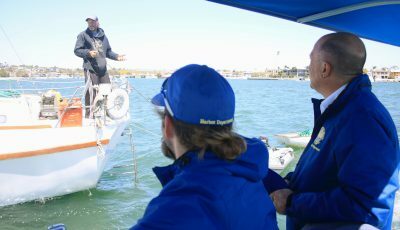 Marshals for information leading directly to his arrest, with an additional reward of up to $75,000 being offer by the city of Newport Beach and private donors. Anyone with information is urged to contact the nearest U.S. Marshals office or the U.S. Marshals Service Communications Center at 1-800-336-0102. For more information, visit countdowntocapture.com, nbpd.org, or usmarshals.gov.